All PHACS sites are expected to have a Community Advisory Board (CAB). CABs serve as forums for PHACS community representatives to share resources, and communicate about issues that affect the research commmunity. In an effort to streamline networking and resource sharing between site CABs, the PHACS Health Education and Communication Committee (HECC) CAB Subcommittee developed the CAB Handbook. To compile the content for the handbook, we surveyed PHACS site CAB members and site staff liaisons about their current CAB practices and preferences. 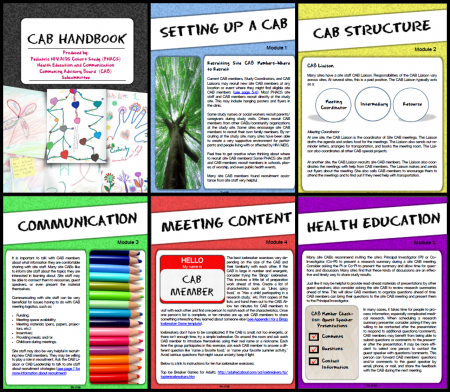 View/Download the CAB Handbook here! The CAB Handbook consists of five modules. In this module, you find will information and resources about setting up a site CAB. This module has information about recruitment including barriers to recruitment, mission statements, retention, fundraising, and incentives. This module contains information about CAB structure and logistics. You will find information about meeting location, meeting frequency and length, number of CAB members, site CAB meeting leaders, CAB liaisons, and site staff involvement in site CABs. In this module, you will find information about site CAB communication including advice and preferences related to confidentiality, connecting the site CAB to the site staff, communcating about site CAB meetings, and connections to other research networks. This module contains information about site CAB meeting content. You will find information and resources about site creating useful site CAB meeting agendas, site CAB discussion and guest speaker presentation topics, ending meetings, tips for monitoring guest speaker presentations, presentations by conference calls and video calls, minutes, and activities outside of CAB meetings. This module contains information about health education within site CABs. You will find information and resources about educational topics, time spent reviewing materials, types of health education information, and research summaries. For more information about the CAB Handbook resource, please email Megan Lukschander.